Meta Linden plurked an interesting SLURL the other day: a link to Daden Limited's sim. 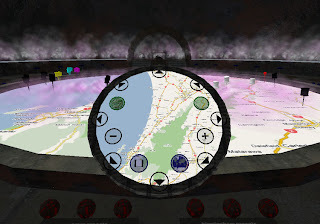 They are a "Virtual Worlds consultancy and information 2.0 specialist", and the company is demonstrating unique uses of Google maps within The Second Life Virtual World™. As I normally do, I decided to explore the location after reading Meta's plurk. Frequently I visit places that, while interesting, don’t really warrant a blog post. However, this place certainly does: I had one of those rare “OMG” moments. 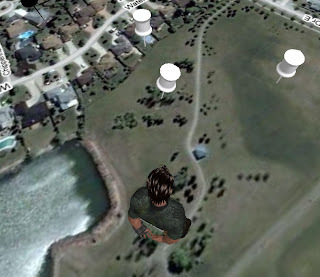 The premise of the site is to provide a house-sized google map on which you may walk. A sluggish, but easy to use control panel is used to navigate the map in the same manner we’re used to from maps.google.com. In fact, the exact same map data is displayed. I could not resist but to find my RL location on the map – what else would one do? Having eventually navigated my way there, I then proceeded to walk upon the map itself. I was standing tall, in my very own neighborhood. Very, Very Tall. The scene was totally familiar, except I was a giant on the street. Striding down well-known paths, I just felt extremely “big”. 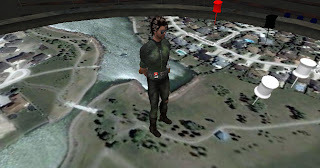 The map data is only two-dimensional, but when you are standing tall on the map, the viewing angle makes it seem somehow weirdly realistic. You’ll see what I mean when you try it.